In dramatic fashion, Saucon senior Jarrett Hirschbeck gets a reversal and then finishes with a pin for the Panthers. 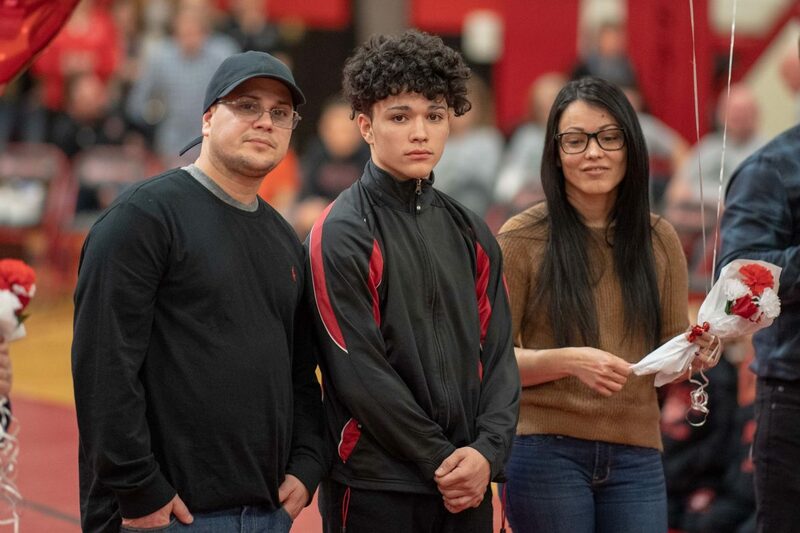 As the Saucon Valley wrestling program continues down the homestretch of the 2018-2019 Colonial League regular season, the Panthers are on pace for more greatness. In a cliffhanger victory this past week, Saucon defeated the Wilson Warriors and kept their Colonial League win streak alive. In addition, the Panthers have locked up another appearance in the Colonial League wrestling championships. Saucon Valley has now won seventy-two straight Colonial League matches and are in pursuit of a seventh consecutive league title. 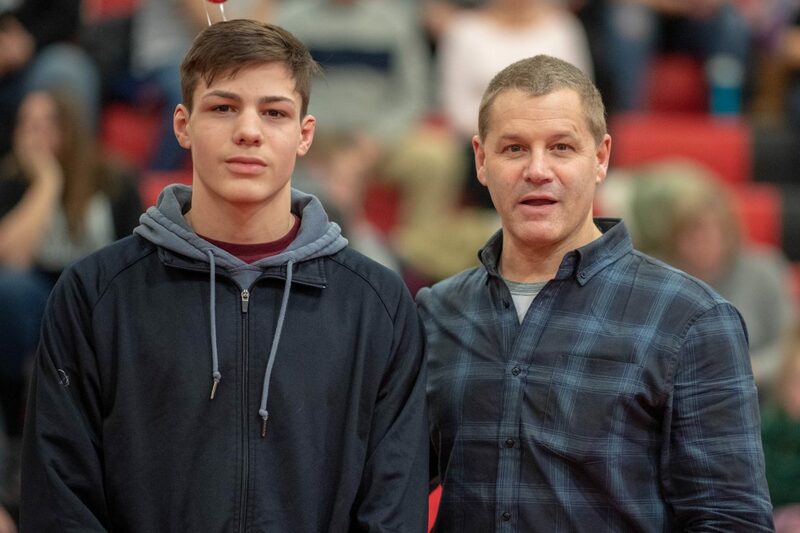 In recognition of his efforts against Wilson last Wednesday night, Coach Shirk named senior, Jarrett Hirschbeck (170) as SV’s wrestler of the match. With his team facing a 27-25 deficit and trailing Wilson’s Cayden Trimmer 5-1 late in the third period, Hirschbeck kept fighting and was able to reverse Trimmer to his back for a fall. The Panther gymnasium exploded with thunderous applause. More importantly, Hirschbeck’s pin gave the Panthers a 31-27 lead with only two bouts remaining. Braydyn Lugardo’s decision at 182 and Dane Csencsits’ pin at 195 sealed the victory for Saucon. Below is a video clip of Jarrett Hirschbeck’s dramatic reversal and pin against his Warrior opponent. The table is pretty much set for the 2018-19 Colonial League Championships on Monday, Jan. 28 at Catty. Assuming Saucon (7-0) gets past Palisades (2-5) on Wednesday and that Northwestern Lehigh (5-2) can squeak by Catasauqua, then the following seedings should come to fruition. However, a Northwestern loss to Catty would open the door for Catty (4-3) to claim the #4 seed. The #2 and #3 seeds appear locked as it will be Notre Dame or Wilson either way. Notre Dame (6-1) and Wilson (6-1) will face-off in their league finale on Wednesday, Jan. 23. The Warriors host the Crusaders and the winner will get the #2 seed and the loser #3. 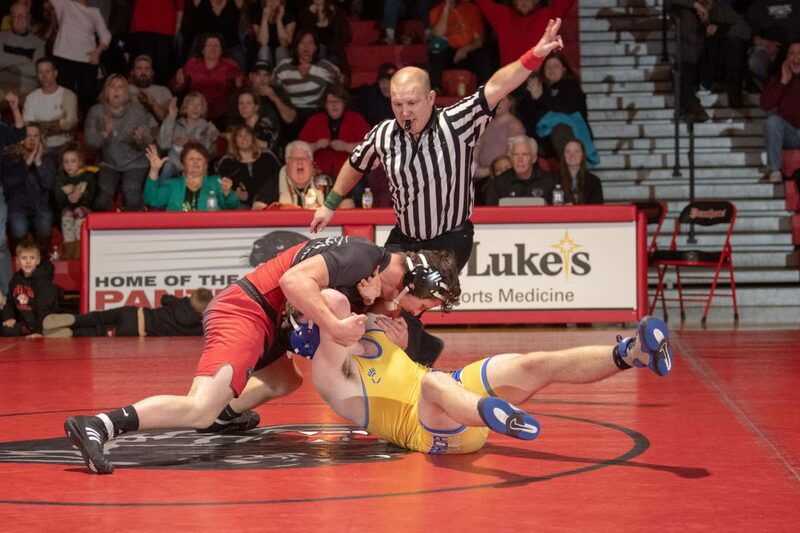 The 2018-19 Colonial League championship is shaping up to be a thrilling double-header of relentless wrestling action! 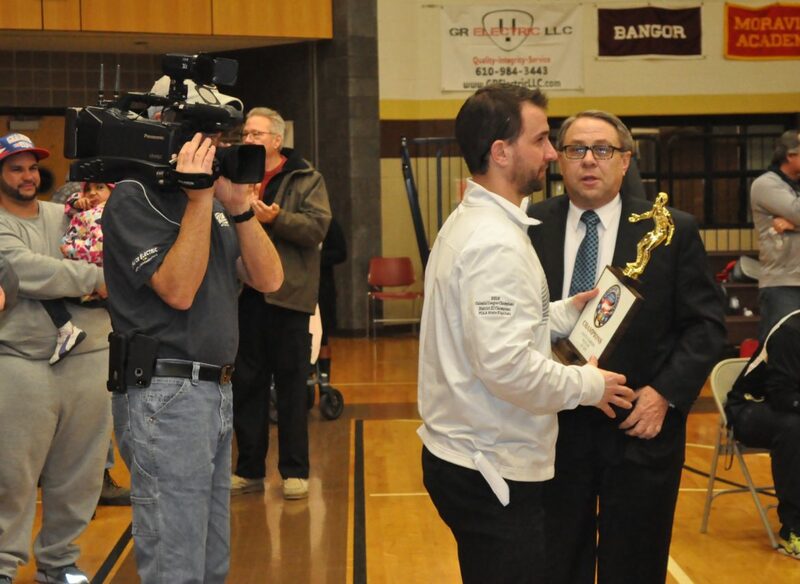 Chad Shirk receives the 2018 Colonial League championship trophy from Wilson Area Athletic-Director Bob Frankenfield. A Saucon Source Shout-Out to the entire Saucon Valley fan base for rocking the house on Wednesday night. Panther Nation was loud and proud! Your energy created a fantastic climate for a high school sporting event! 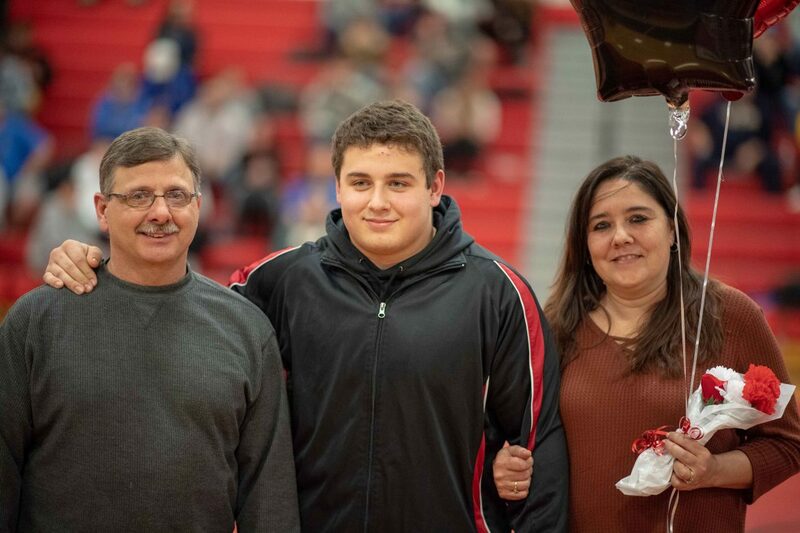 A big Shout-Out goes to the senior wrestlers and their parents. A little unfinished business remains, but you will be missed. Many thanks to you and your parents! 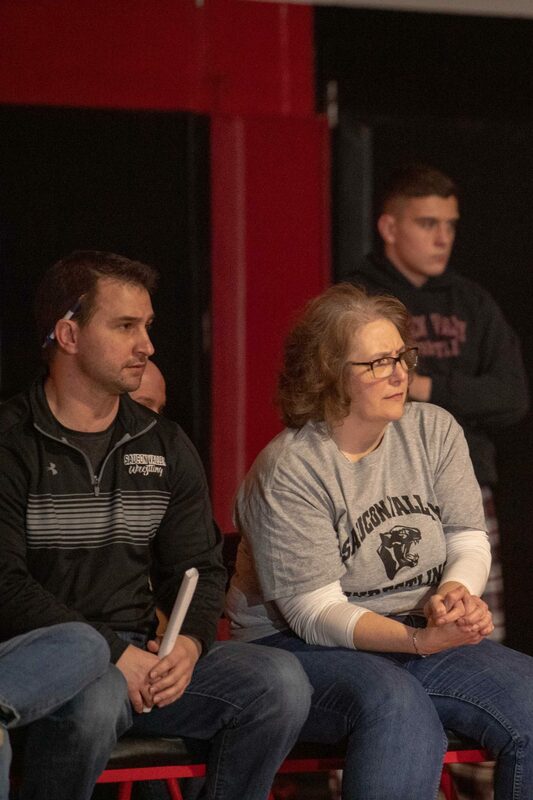 Another Shout-Out to members of the Saucon Valley high school faculty who were honored by individual wrestlers Teacher Appreciation Night. Thank you for leaving your mark! Saucon Valley high school math teacher Cheri Chisesi looks on with Coach Shirk. Up Next: The Panthers will head back out on tour as they travel to Palisades on Wednesday night for the regular season finale against the Pirates (7 p.m.). Palisades currently owns a 2-4 Colonial League record with wins over Salisbury (46-23) and Pen Argyl (33-32). The Pirate losses have come at the hands of Bangor (48-25), Southern Lehigh (46-30), Notre Dame (53-19) and Catasauqua (37-36). It is a safe bet Palisades will register a fifth loss to Wilson. Photos courtesy of Chris Christian…. 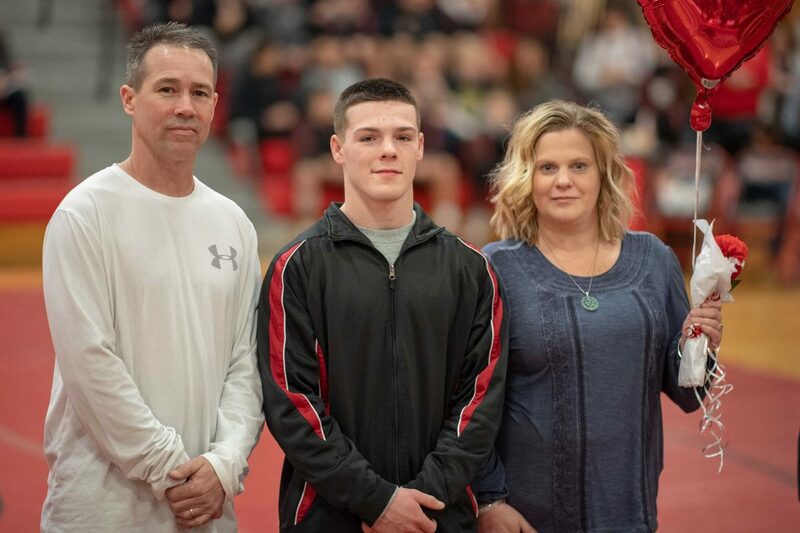 Jared Harka and his parents. 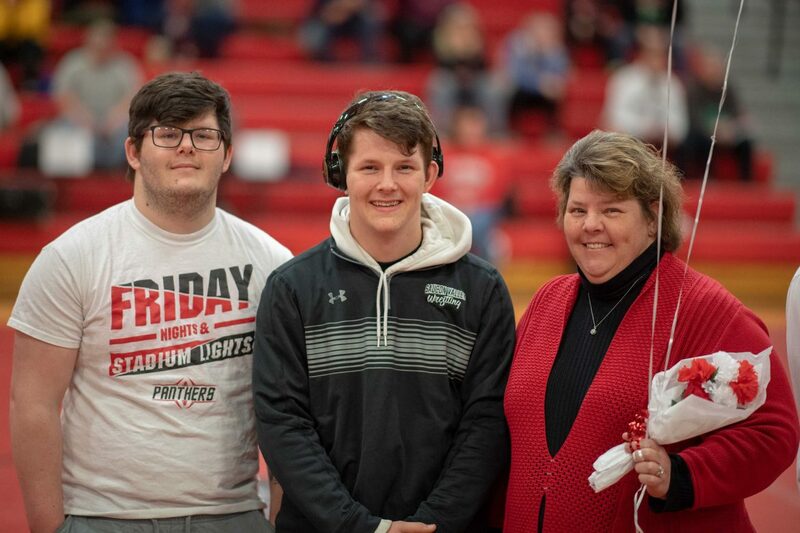 Jarrett Hirschbeck with his mom and brother. Josh Jones with his parents. 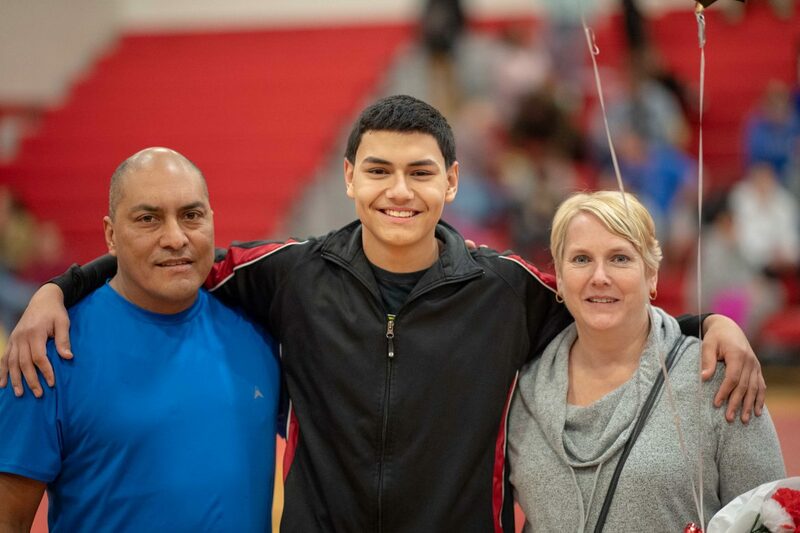 Carlo Ortiz and his parents. Nick Rosengrant with his father.